In Depth: NBC is Looking for Viewer Feedback on MSNBC…and Mulling a Return to POV Dayside Anchoring? 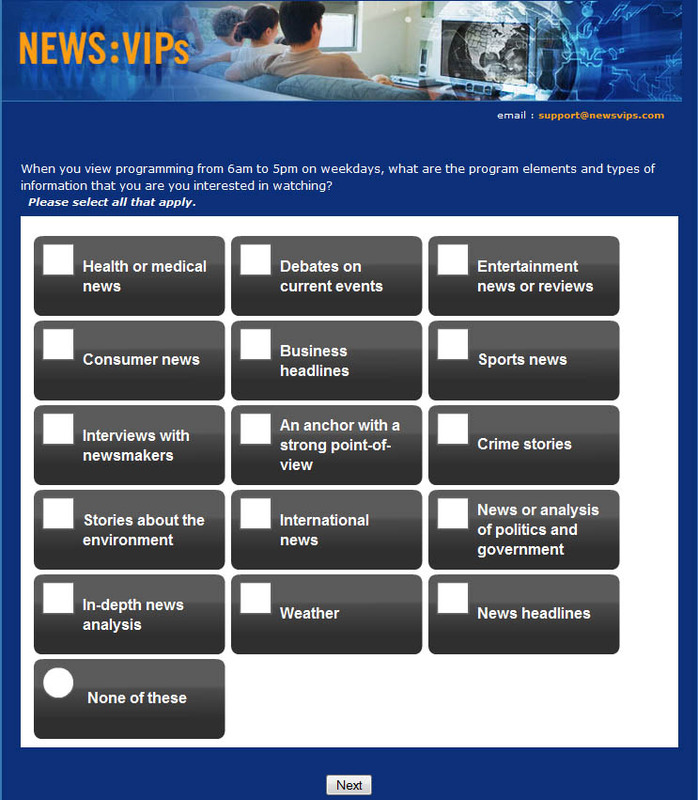 This section surveys what viewers are looking for from their news channel. Note the “Anchor with a strong point of view” choice. NBC is also interested in why viewers might change a channel to another network, in this case FNC. I’m told there was a similar question concerning CNN as well. This slide is part of a longer survey that covers what viewers want from their news. 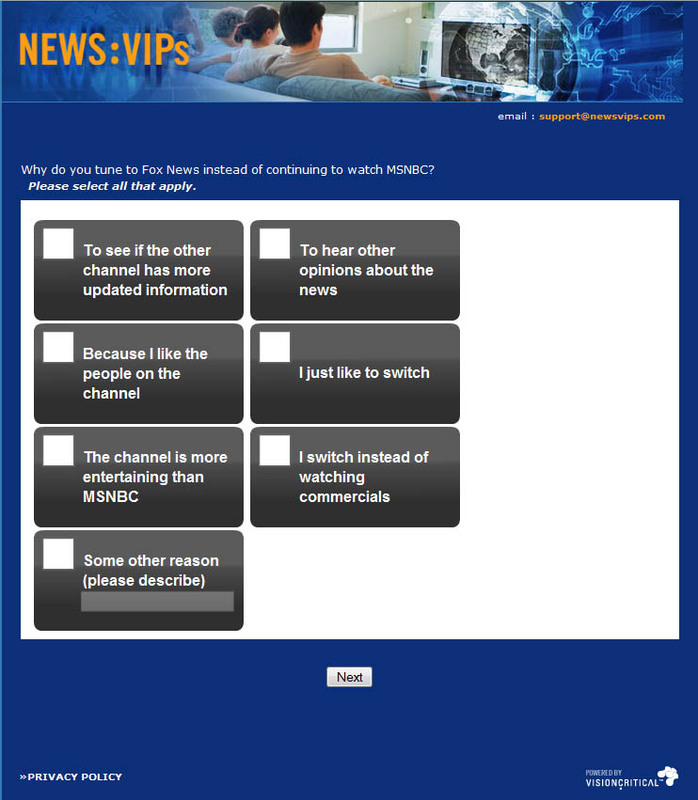 Note the “I enjoy programs with an opinionated host rather than a program which presents me with just the facts of a story with an objective anchor” and the “I prefer news sources that share my point of view” and the “I enjoy news programs that have a host that has a point of view or opinion on the issues being discussed” choices. Add that to the “Anchor with a strong point of view” choice mentioned earlier and you start to wonder what NBC is thinking about in regards to MSNBC. It suggests to me that they’re still mulling going down that opinion dayside news path even after last year’s resounding ratings-reflective rebuke of a previous attempt at putting in POV anchors and shows on the dayside air. They wouldn’t be asking about these subjects if they weren’t still mulling doing yet another 180. Then again, this could all be related to what happens in the evenings and primetime and not at all related to dayside. There’s enough ambiguity in the survey questions for it to be interpreted either way. The survey also concerns the subject of on air talent. Not only are MSNBC’s talent roster surveyed but I’m told a good chunk of their on air contributors/analysts are surveyed on another page. 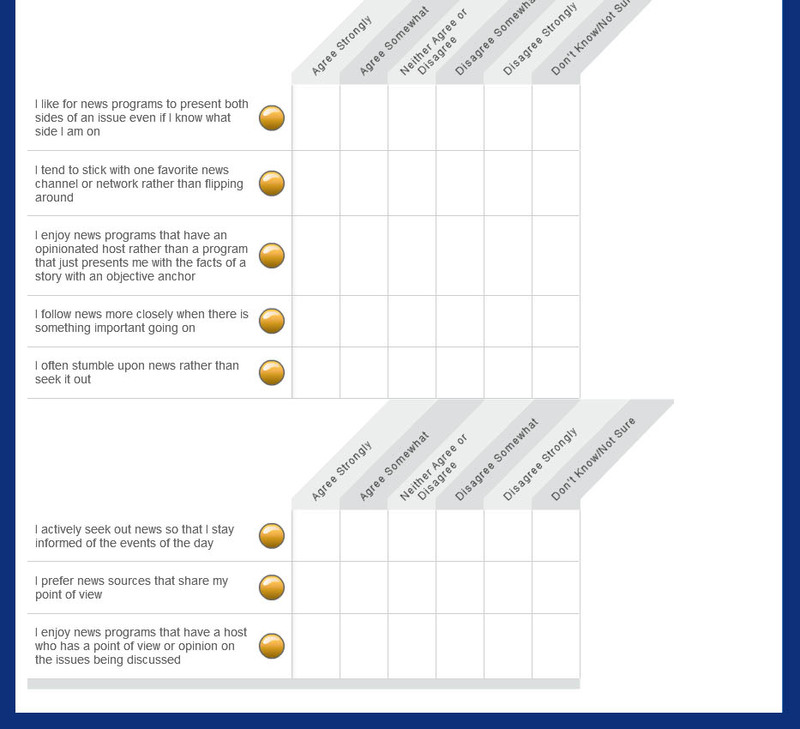 But it’s the talent survey that has some really interesting tidbits because of who’s included and who is not included. Among the included list the biggest surprise is Karen Finney. Finney is not currently an MSNBC anchor, though she did do a stint one day on a weekend last year. After the Carlos Watson debacle and the January dayside reboot, to find Finney here is a real surprise. I have a feeling many respondents aren’t even going to be able to rate her since they’ve never seen her anchor and those that will rate her will rate her based on her current role as an analyst. The other surprise, though not a surprise to me, is the inclusion of Lynn Berry. I’ve been watching Berry closely for a while now and am convinced she’ll be moved off of Early Today/First Look before the year is over. It’s not a state secret Berry has long ties with Jeff Zucker but that alone isn’t enough to move Berry off overnights. She’ll be moved off because she’s been solid so far when she’s filled in on MSNBC and the five times she’s done the news update desk on Weekend Today. Where she’s moved off to is the real question. There’s one big name on this list that’s missing; David Shuster. This all but confirms that Shuster is not part of MSNBC’s future. The other name left off, even though she still shows up anchoring occasionally, is Norah O’Donnell. Too bad. This also is a huge signal that despite the wishes of some of the commenters here, O’Donnell will not be making a return to the anchor chair full time in the near future. This entry was posted on June 23, 2010 at 4:03 pm and is filed under In Depth, MSNBC. You can follow any responses to this entry through the RSS 2.0 feed. You can leave a response, or trackback from your own site. Wait…so who exactly took this survey? An ICN occasional tipster. They’re part of the News: VIPs program. I know J$ is also connected to one because he’s sometimes told me about surveys that were out before my contact would. I like Lynn Berry, as well. Attractive, good straight news anchor and has been a trooper dealing with her short stints in small roles for MSNBC. If she wants a bigger role, she certainly deserves it. I still don’t get why Alex Witt is kept at WAY early in the morning and on weekends… I’m assuming she wants it that way, though. Hopefully, she’s moved up the ranks, if she chooses to. One of the two hours with Tamron Hall need to be filled somehow… there’s no reason to repeat her, again, for another live show. ^Really? I had no idea. Isn’t that one of the circles of hell? I have NO idea what that is… but I guess if she has this role as anchor on weekends in the morning, it’s for a reason. It’s just too bad… she’s really good at what she does and would totally shine being on in daytime. I’m assuming she asked to get the position she has anchoring… I don’t think anybody in their right mind would accept that duty if they were told to do it, though. Who even watches her at that time, or knows she’s on? I am watching MSNBC now, and I am somewhat irked that you are now focusing on the idiotic scandal at the VA. They have been corrupt and inefficient for years, and I think it is another attempt to blame the Obama administration for something that has been endemic for years. When I worked at a mental health clinic from 2002-2009 and my fees were billed to Medicaid, my social security number was “lost” by the VA because one of their employees took a lot of personal information home on his laptop, which was allegedly stolen. The VA apologized for this lapse and offered me a year of free identity theft protection. Oh, please. I never even worked for the VA. I wish Obama would stop talking about being so overwhelmed as Commander in Chief and not tolerating misconduct. He wants to held anyone who has engaged in misconduct at the VA to be “held accountable.” Since when has he held ANYONE accountable for anything? What about the bankers and the Wall Street crooks who destroyed our economy? What about GM, which he bailed out to produce cars that seem to be unsafe at any speed? Why on earth did he create more injured vets by sending more troops to hapless Afghanistan? He is now welcoming Congress as a fellow watchdog. Come on. The folks in Congress don’t care about much of anything. Except burnishing their financial profiles. He is now just sounding stupid. He is bragging about his accomplishments for veterans. Maybe, like Hillary, he is also suffering from “brain damage.” Just kidding. She at least knows when to shut up. I hate the direction of this country, but it is in effect no one’s fault. Power corrupts, and absolute power corrupts absolutely. MSNBC can’t do too much. I never thought I would miss Keith Olbermann, but I do. Chris Matthews has become a self-promoting schnook; Rachel Maddow is doing some brilliant investigative reporting, or perhaps her staff does, but she is too strident and ungrateful to Keith Olbermann. Chris Hayes’ heart is, I guess, in the right place, but he is becoming kind of full of himself, too. I still like Melissa Harris-Perry. I guess she is much too smart to enter politics, but she might be a good President. Obama just acknowledged that the buck stops with him, but Harry Truman said it better. He as more humble. And I voted for Obama. Twiice. I guess I’ll have to vote in 2016, but I don’t relish the thought. I am so sick and tired of Chris Matthews rudely interrupting his guests, I can’t stand to watch him anymore. The other complaint I have is that I don’t see Craig Melvin enough. I think the media did a serious unjust by revealing and publicizing information illegally obtained such as wikileaks. If you could not verify the information obtained and knowing the information was stolen why would you publicize it, knowing it would only do harm in aiding the thief. It makes the media the tool wikileaks needed. People private emails are just that and you are as guilty as Julian Assange!